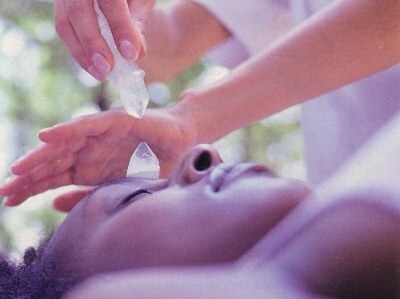 Crystal Healing is one of the deepest and gentlest healing techniques available today. Its highest form is the 'Crystal Layout' where light and colors from specific crystals are beamed into your Chakras and your Auric Field. They are focused at the points where the Chakras and your Aura are most sensitive, and may be in need of balancing. The state of your Chakras and your Aura control the energy flow into every area of your life. Healing your Chakras and your Aura with light helps you gain clarity, change old habits, release negative emotions, remove blockages that keep you from realizing your dreams and manifesting your personal path. This makes it easier to create positive situations in your life. A crystal healing session involves discussing your circumstances and growth opportunities, scan-reading the current patterns in your aura, soul path diagnosis, listening to the angels and then laying stones and crystals on and around your body. This allows them to shine their healing light into your Chakras and Auric bodies. You will also receive some Flower Essence or Homeopathic suggestions to facilitate some of the heavy lifting and deeper change for you as you walk your healing path. Full 90 minute Crystal Healing sessions are $175, and discounts are usually available to get it within your budget if that is too high. Every layout is different, designed for your personal circumstances, goals, and Auric balance. These descriptions of the basic layouts may provide you with an idea of how crystals could help you. Uses predominantly clear crystals to bring clarity, protection, and strength. Adds specific colors to the light layout to heighten desired effects such as calmness, creativity, or mental clarity. Adds lots of pinks and golds to the light layout to bring feelings of joy and love. Very enjoyable. Uses deep-acting crystals and stones to open and heal the heart of past pains. Helps you manifest more love in your life. Fluorite Octahedrons connect you to your Higher Self, and bring its help into your life. Produces lots of practical & creative solutions. Uses earth stones like Hematite and Green Jade to ground you fully back into your body, calm & integrate your feelings, embrace your earth path, and walk it successfully. Opens the third eye and the Crown Chakras. Heightens your intuitive abilities and helps you access Spirit's help and guidance more easily. Cleans and heals your Aura of old patterns, which eases the limitations those patterns have imposed on you. Takes out negative thoughts and self criticism. Decreases self-sabotage. Uses black obsidian and other stones to cleanse the Aura of old & negative emotions, patterns, and energies. Cleanses the negative effects of toxic people, habits, and environments. Works into larger areas of damage and hurt, and closes the holes left by traumatic experiences. Similar to the Trauma Healing Layout but also focuses on building the aura's ability to protect you in the future.